At a time now past, a cat was born. Read it online at Tor. reread in April, 2018 and loved it just as much. A long time ago in Japan, when cats were new there, an earthquake shook Small Cat’s home, and her city caught fire. In escaping the fire she ran too far from her home and her fudoki. 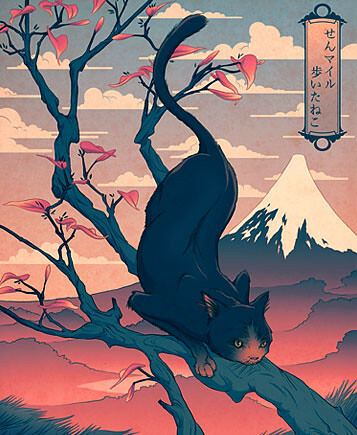 “The fudoki was the collection of stories about all the cats who had lived in a place. It described what made it a home, and what made the cats a family.” In fleeing the fire the Small Cat gets lost in the city but decides to follow the story of her aunts, The Cat Who Came From the North. And so she heads North. But she goes too far and soon is so far from home that she thinks she will never find her way to her fudoki again. I read this short story way back in 2009 when it first made an appearance on Tor, but seeing was experimenting with my new kindle and so downloaded this. And then ended up rereading it on a train journey. And I love it just as much now as I did back then. It is a short story, well, maybe more of a novella, and it told in a wonderful lyrical style. And Small Cat is such an engaging little heroine, even if she doesn’t have much to say. It is, I think, a book about what home is. As well as examining how you come to create your own identity. At the start of the story Small Cat has an opportunity to move in with some strange cats, but the idea of it is horrible to her because she would have to forget her fudoki and instead learn the fudoki of this other family. And that she is not ready to do. Through the story she begins to understand that it is our journeys that create us, but also that our lives are our fudoki. Small cat has a chance to create a new home, but only once she is ready to do so. I love Kij Johnson’s work so much. I can’t believe I’ve yet to read this. I’ve downloaded a few of her shorter stories from her site, plenty to keep me going, and I read her Fox Woman ages ago & loved it.